The Boundless Informant documents show the agency collecting almost 3 billion pieces of intelligence from US computer networks over a 30-day period ending in March 2013. [...] Other documents seen by the Guardian further demonstrate that the NSA does in fact break down its surveillance intercepts which could allow the agency to determine how many of them are from the US. The level of detail includes individual IP addresses. IP address is not a perfect proxy for someone's physical location but it is rather close, said Chris Soghoian, the principal technologist with the Speech Privacy and Technology Project of the American Civil Liberties Union. "If you don't take steps to hide it, the IP address provided by yourinternet provider will certainly tell you what country, state and, typically, city you are in," Soghoian said. This might be true, but it is by no means certain. IP addresses don't only apply to people -- the targets of the investigation -- but to the servers on Web sites tracked by the NSA and used by its actual targets. Here's an example of how this might work. All nice and simple, and Joe's IP address does indeed correspond, roughly, to his physical location. Now let's say you're the NSA and you're building a dossier on Joe. So every time Joe posts on Shamikh, you have automated software that "scrapes" a copy of the forum page. So now you have two IP addresses and two locations, but Joe is only sitting at his computer in one of them. Of course, the NSA is also interested in Shamikh, where Joe hangs out, so let's say they use some kind of automated software to scrape every page on the Shamikh forum along with some basic useful information about the page -- date created, software used to make it, and the IP address of the server hosting the page. To keep it as simple as possible, we'll say there are 5,000 posts on Shamikh's forum, each one a post created by a different user. Eighty percent of the users have been sloppy and exposed their IP addresses, while 1,000 kept their IPs hidden. Six of the sloppy users live in Ukraine. 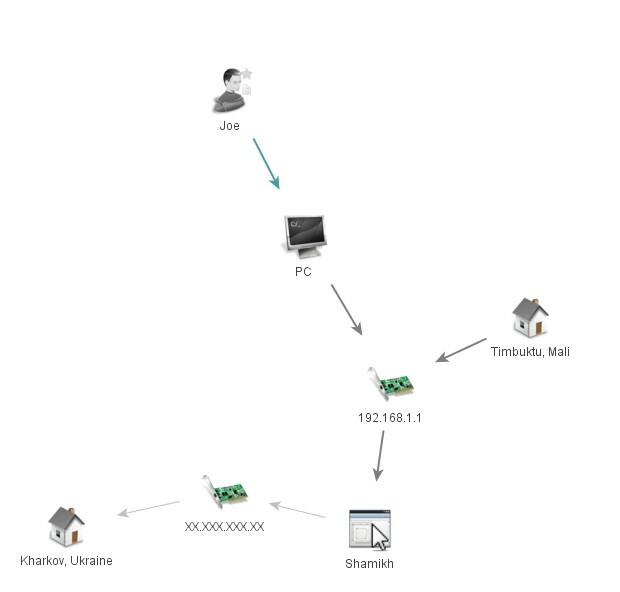 What you end up with, in this very simplified example, are 5,000 records for pages containing 9,000 IP addresses -- 4,000 for users spread all over the world, and 5,000 for the Web pages on which those users posted a comment, which are associated with an IP address based in Ukraine. If you made a heat map of all the IP address you had collected, more than half would be located in Ukraine. Ukraine would be red hot on the map, and every other location would be much cooler. But only six of the 5,000 users actually *live* in Ukraine. A snapshot of the Boundless Informant data, contained in a top secret NSA "global heat map" seen by the Guardian, shows that in March 2013 the agency collected 97 billion pieces of intelligence from computer networks worldwide. You can't look at the map and jump to conclusions about where the targets of surveillance are based. The map does, to some extent, reflect the locations of the targets, but it almost certainly also includes the location of the infrastructure they use. According to the heat map, an "orange" amount of the "pieces of intelligence" (theoretically based on IP addresses and other infrastructure) have been geolocated to the United States. Orange is not a very specific amount, and we don't know if the data has been rendered on a logarithmic scale, which is often used to visualize large amounts of data by scaling (i.e., distorting) its actual value. For all these reasons, you can't reasonably infer that some plurality of targets of surveillance are located in the United States. Many, many, many global extremists use Web sites hosted in the U.S., but very few of them live here themselves. On the flip side, none of this *precludes* the possibility that many targets are based in the United States. But when you're looking at a Powerpoint map chart (for God's sake) designed to visualize 97 billion bits of information scraped from the world every month, you have to recognize that a lot of detail is dropping out for the sake of visualization. This is complicated stuff, and it's important to understand what mountains of information and complexity lie behind an extremely simple graphic. What I've outlined here is likely only the tiniest slice of that complexity. We know a whole lot more about the NSA's programs than we did last week, but the information we lack vastly outweighs the information we have. We should be cautious in interpreting data summaries we don't fully understand.